The Bannockburn Road in Clyde River is one of the lovely old roads. This photo was taken sometime between 1940-50 and close by one of the old mills featured in our history book. 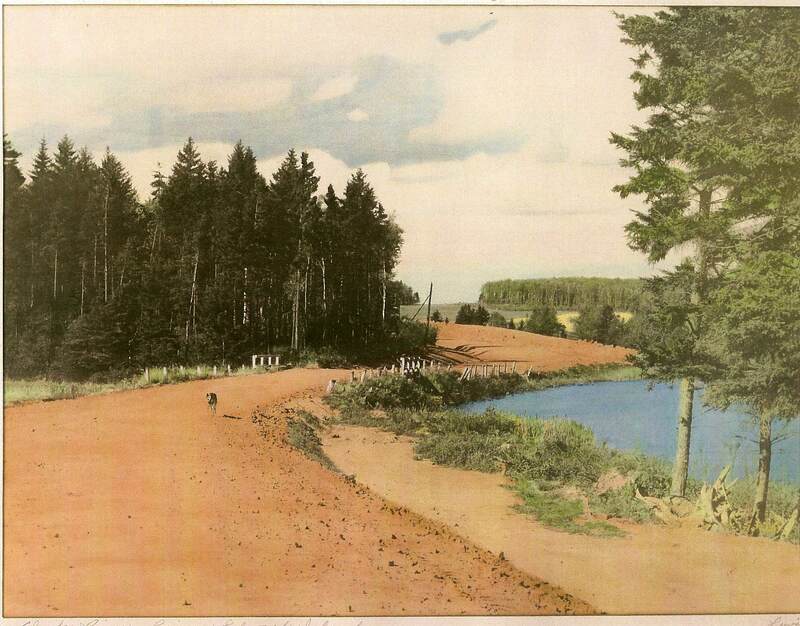 What is it about old roads, especially when they are unpaved and in PEI? Any of us who walked to school before massive political paving efforts remember them well. In Summer when things were dry, you had to cover your eyes and mouth when a car would go by blowing up dust. In Winter, you had to watch the ice on the hills and take a toboggan in the car in case the road that was open when you went to the city was not open when you came home due to drifting, and you would have to haul kids and groceries. And Spring, yes, there was not any possible way to not feel like a country bumpkin unless you had a pair of shoes with you, and you immediately removed your mud-laden boots the moment you had arrived anywhere, but the red mud on the car wheels was undeniable. We can all remember these times, but what the bus-driven students of today do not get the pleasure of is stopping at the little bridge like the one you see here on Bannockburn Road to watch the fish swim in a rush of water, to watch cows in the fields that would come out to meet you at the fence, or at the end of your journey on this road, to stop at the corner store to pick up a small bag of potato chips, pull a pop out of ice cold water in the cooler or open a fresh pack of hockey or baseball cards with bubblegum. The original of this photo above hung in the MacNeill home for many years, and they had always thought it was of the Clyde River Road. It was only very recently when Terry MacNeill showed it to Laura Scott, someone well acquainted with the geology of Bannockburn, that the exact spot where the photo was taken was recognized. Her car had been stuck in mud there during the time when the road was being reconstructed, an experience that others of us may share. It is easy to see how the road could have been mistaken, because what we see is a photo of our memories of our own PEI roads. This picture brought back a flood of memories for me. It opened up so many things that I had forgotton about – how wonderful to have this picture bring them back to me. I was telling my husband and son about walking to and from school along the Bannockburn Road and how the cars made the red dust rise and how it would then settle at the side of the road. Walking home from school, I would take off my shoes and socks and walk through that red dust that was as soft as flour. If you kicked it, it would make little clouds around your feet and ankles and if you stamped them you could make bigger ones. If you were really careful you could wash all this off at the side of the stream so your mom wouldn’t get upset about all the dirt. But you had to be very, very careful because if you ever fell in you knew that meant even bigger trouble!! Many hours were spent sitting on this bridge with my feet dangling over the side, watching and listening to the water. The bridge crosses over the Baltic stream that joins the main stream as shown in the picture. This stream originated somewhere in Kingston and meandered back and forth crossing the Bannockburn Road eventually flowing into the Clyde River.